These beautiful 100% wool, handwoven and naturally dyed rugs are for sale. Most are woven by master weaver Federico Chavez Sosa and are 4 x 6 feet, and are $700 to $1,100. I am happy to quote you specific prices if you are interested! 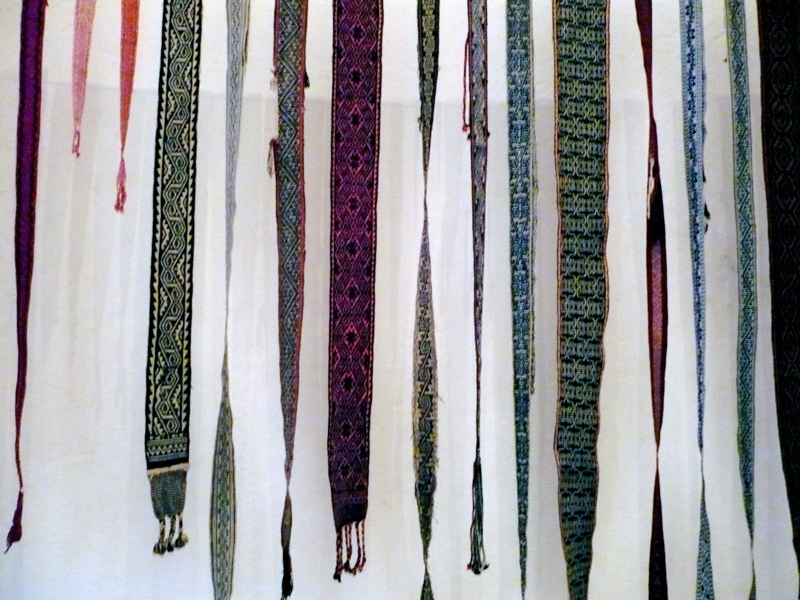 “From Mitla to Sumatra” is on exhibit at the Museo Textil de Oaxaca through early August. 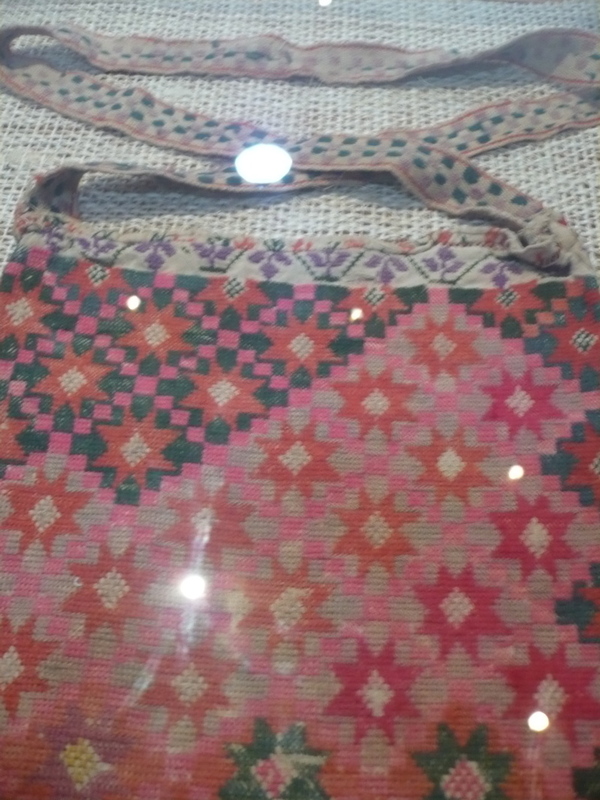 It is an extraordinary display of weaving from Oaxaca and her surrounding villages, plus similar designs that are prevalent in Indonesia, Africa, and China. Alejandro de Avila, the exhibition curator, has subtitled the grouping, “the art of the fret.” The fret, or greca, is a ubiquitous design that appears in textiles around the world — a wonderful commentary about our connection to each other as human beings. 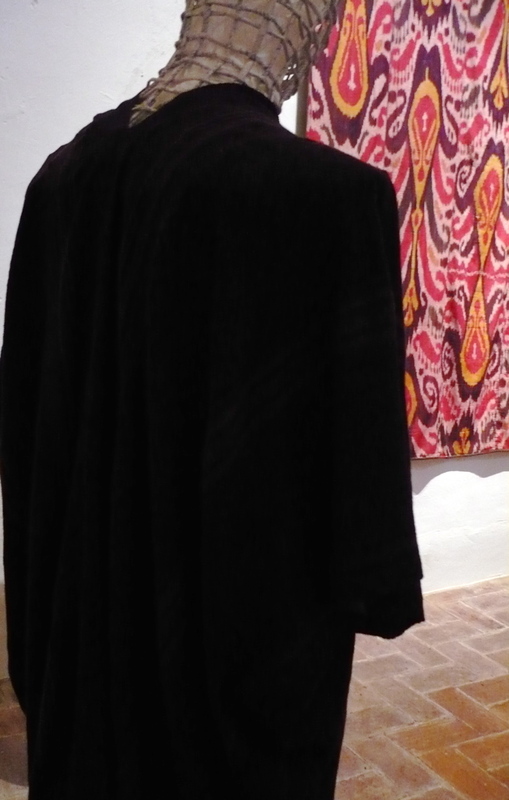 This exhibition features clothing and rugs that incorporate the design of the fret. 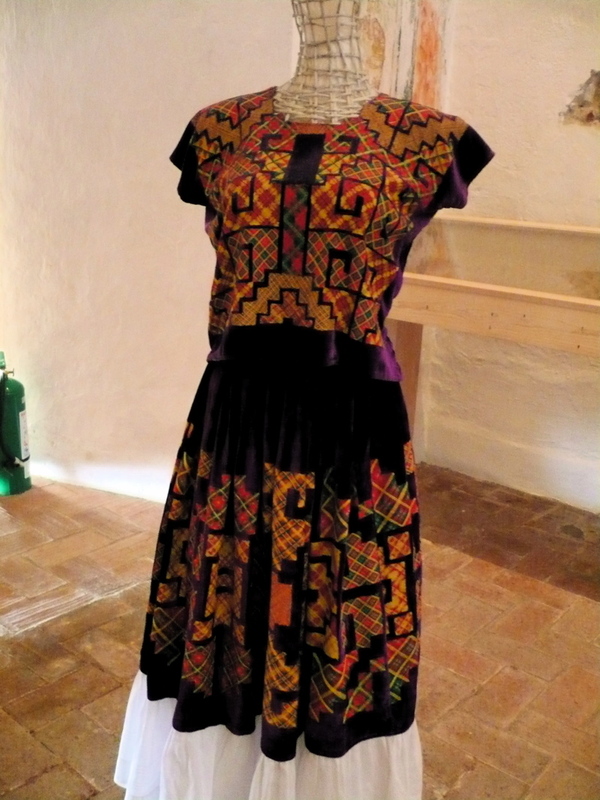 The museum’s permanent collections include traje or clothing representing the the many indigenous people’s of Oaxaca, including woven and embroidered blouses, skirts, shawls, rugs, belts, and other articles of decoration and clothing. This is the only museum of its kind in Mexico, and if you are in Oaxaca — a locale noted for its incredible textiles — this is eye-candy you won’t want to miss. Since the museum does not yet have a complete website, I though it would be helpful to give you a taste of what is in store when you visit. 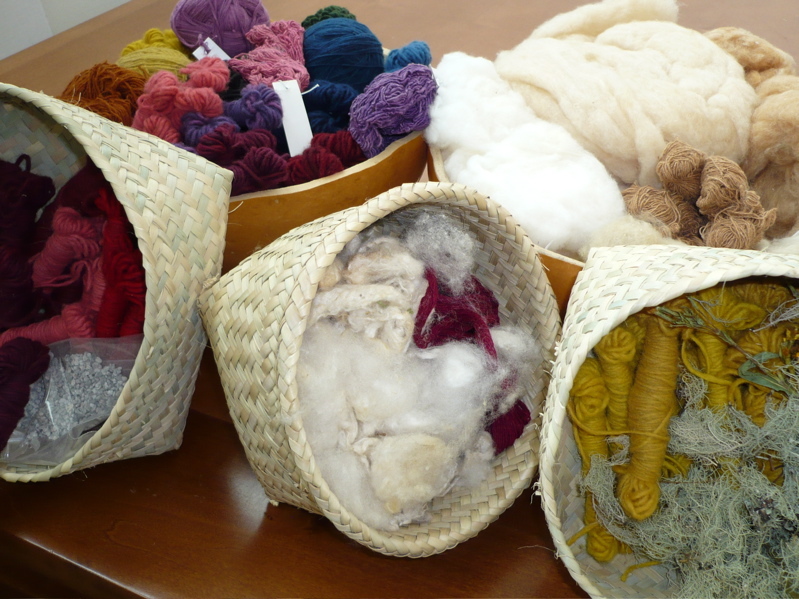 There is a great museum store on site that offers silk and wool handwoven scarves, two beautiful shawls woven by Roman Gutierrez, an array of precious, intricately woven huipils, and some wonderful books on weaving for sale. Francisco Toledo has donated his library of world textile publications, and the biblioteca at the museum is spacious and comfortable, open for public use. I just love the design of the gas stove in the dye kitchen at the museum. The counter top is cement with an integrated color of warm yellow. 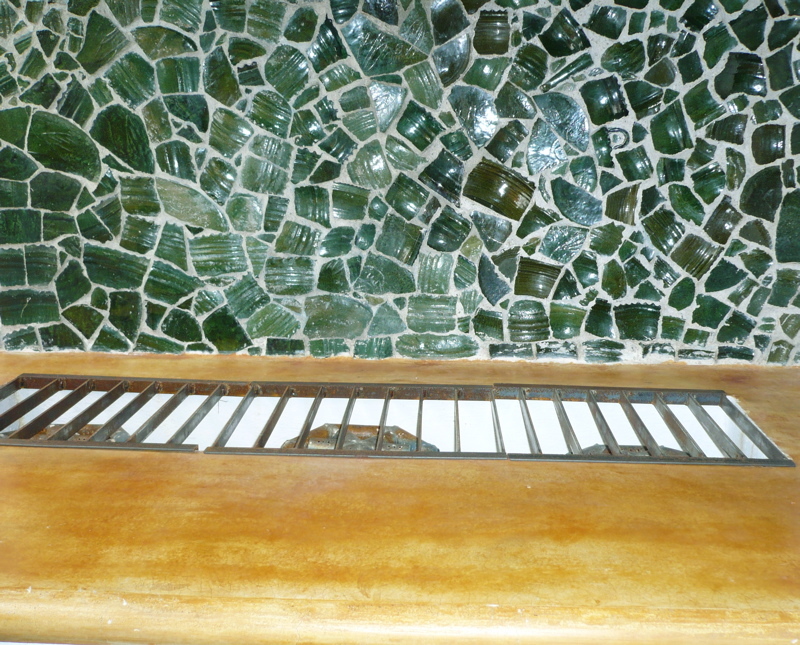 The backsplash is broken tile shards from the pottery village of Atzompa. The museum’s director, Ana Paula Fuentes Quintana, anapaula@museotextildeoaxaca.org.mx is a textile artist who studied in Barcelona where she earned a master’s degree. She encourages everyone who is interested to come and visit. 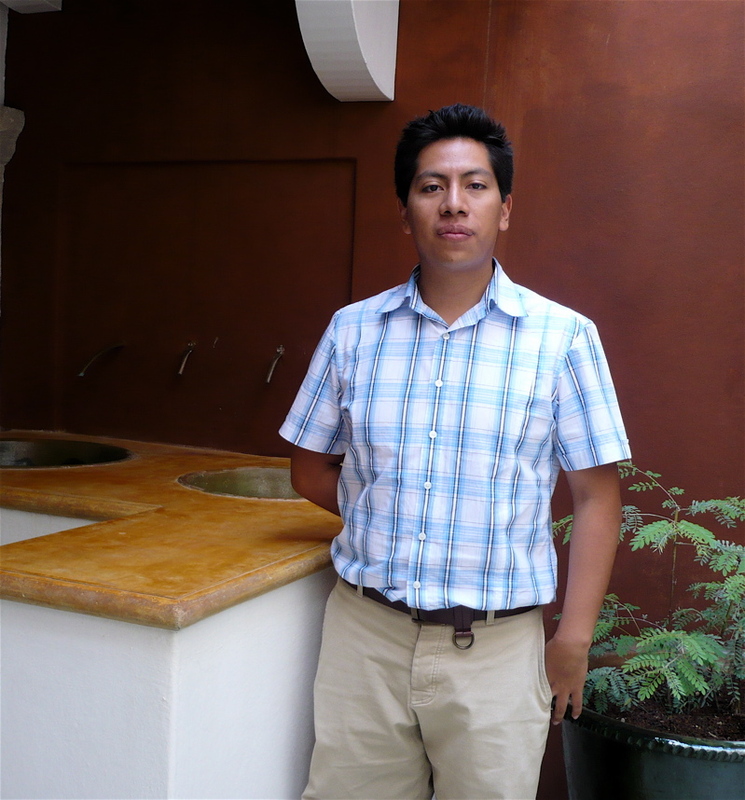 The coordinator of education is my friend Eric Chavez Santiago, educacion@museotextildeoaxaca.org.mx who organizes programs for students, teachers, and artists, is creating a display of natural dye materials, and is developing certification for weavers to authenticate their use of natural dyes. 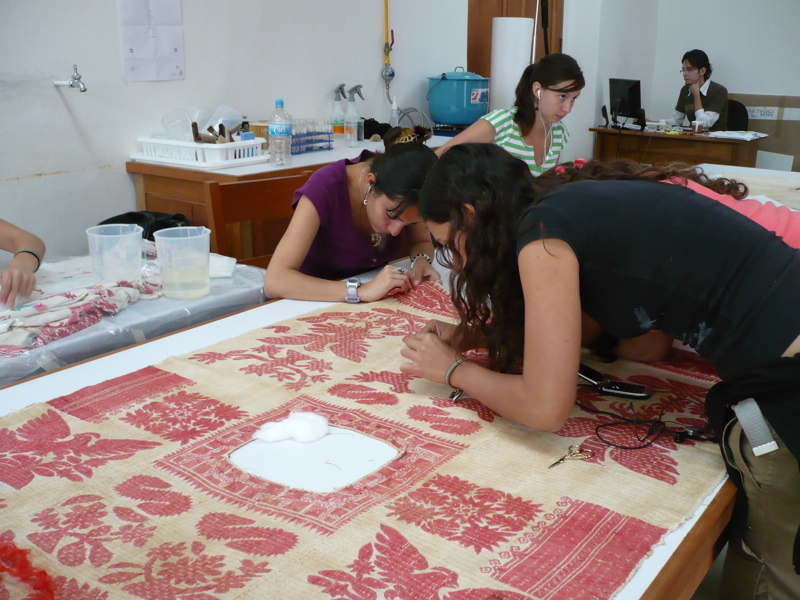 Here is a photo (above) showing the restoration process of a very special huipil, in an area dedicated for the preservation of textiles. 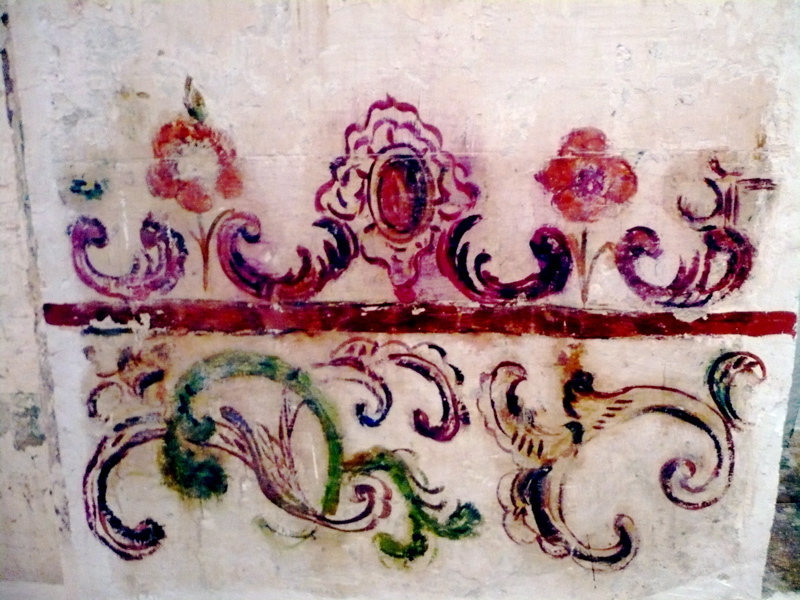 The museum relies on volunteers for this work. If you are interested in knowing more, please read The Unbroken Thread: Preserving the Textile Traditions of Oaxaca. 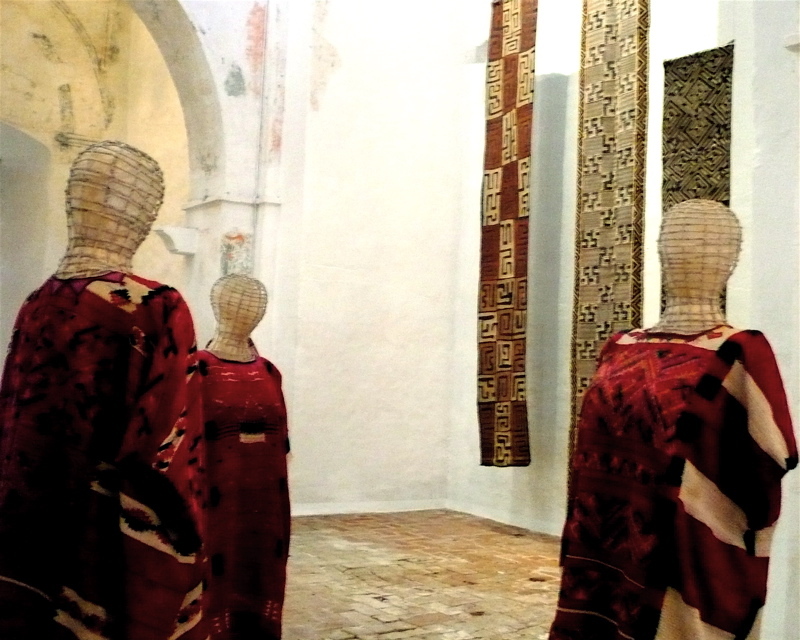 Museo Textil de Oaxaca is free and open to the public every day except Tuesday. 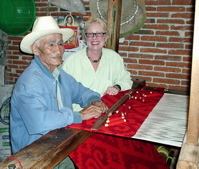 Funded by the Alfredo Harp Helu Foundation, its mission is to preserve the textile traditions of Oaxaca, teach and educate about the weaving process, restore antique textiles, and showcase the textiles from Oaxaca and around the world. 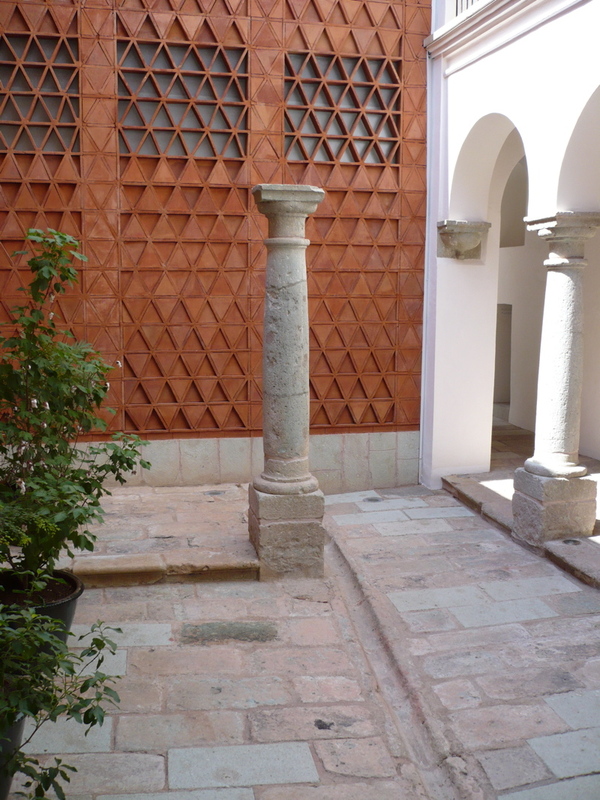 It is housed in the renovated 18th century Casa Antelo and a part of the ex-convent of San Pablo. The facilities are extraordinary: arched colonial doorways and windows, stone walls and floors, and original frescoes that have survived. The original owner of the Casa Antelo was a cochineal merchant, so the link from past to present is particularly cogent. Coming Soon: Workshops for Children and Young People, ages 6-10 and 11-16, from July 14 to August 16. Contact the Museum for more information and to register: 501-1104 or 501-1617, extension 104. New Exhibition Opening Friday, August 15: Woven and Crocheted Plant Fiber Handbags, opening reception that evening. Walk down Avenida Benito Juarez, the main road of Teotitlan del Valle, or stroll through the central commercial market next to the church and village museum, or go down the side streets and walk into any weavers home, and you will see the myriad different patterns and designs incorporated into the woven wool rugs. Traditional designs will incorporate the patterns you see on the Zapotec temple ruins that make up the foundation of the village church, plus other patterns found in nature. These include grecas (Greek key), the caracol (Pre-Columbian snail), lightening (zig-zags), animals such as birds, lizards, armadillos and jaguars, mountains and rains (alternating pattern of undulating waves, dots, dashes, stripes, and overwoven squares), Zapotec and Aztec god figures, lightening and stars. The “tree of life” pattern filled with birds and animals is a favorite and loved pattern incorporating many anthropomorphic figures. If you pick up a copy of the Codex Borgia, you will see that some weavers love to incorporate some of these early Olmec/Aztec/Zapotec images in their weaving. 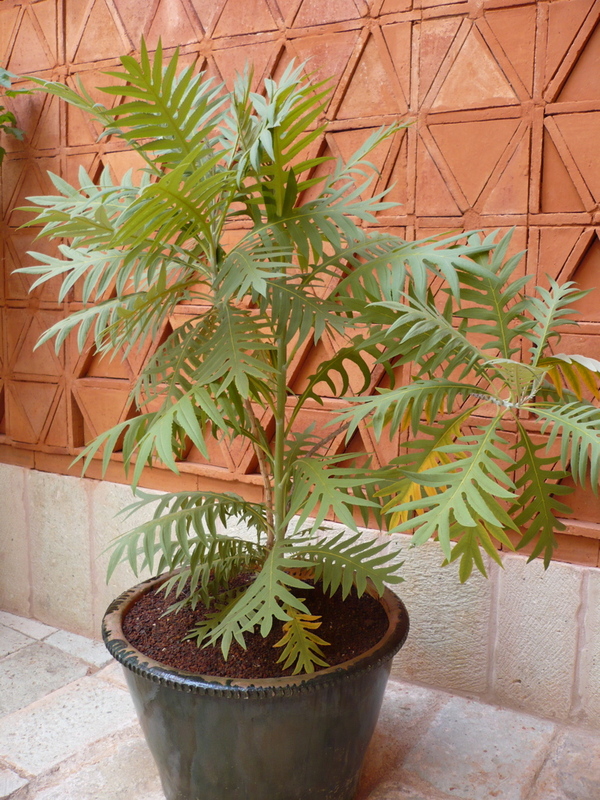 Many will play on the size and scale of a pattern to vary its interest. Weavers will also create or mimic contemporary patterns they think will sell, like a Joan Miro or Escher painting or a portrait of Benito Juarez or Che Guevarra. In the 70’s and 80’s, dealers from New Mexico and California came to Teotitlan to find a cheaper source for creating “Navajo-style” rugs. They brought with them traditional Navajo designs and asked village weavers to reproduce them. Today, you will see this influence in work that incorporates the use of both traditional Zapotec and Navajo patterns, creating a hybrid of sorts. It is important to be able to discern between an authentic Navajo rug and one reproduced in Teotitlan if you are a collector. 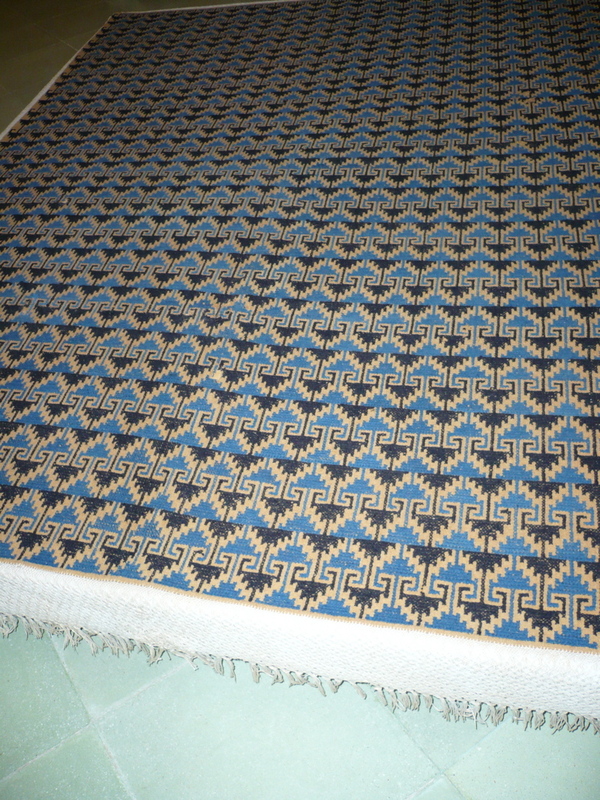 Now, China has entered the Mexican weaving market, is copying rug patterns, and reproducing them even more cheaply. 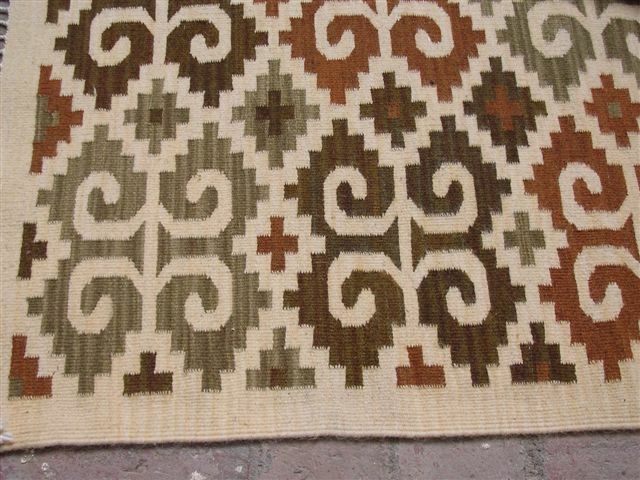 Soon, perhaps, the Sam’s Club in Oaxaca City will be selling Zapotec designed rugs made in China. Is this the benefit of a global economy? 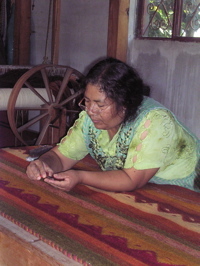 The weaving cooperative, Bii Dauu, as part of its mission, only sanctions the use of traditional weaving patterns for its members as a practice of preserving Zapotec cultural heritage. 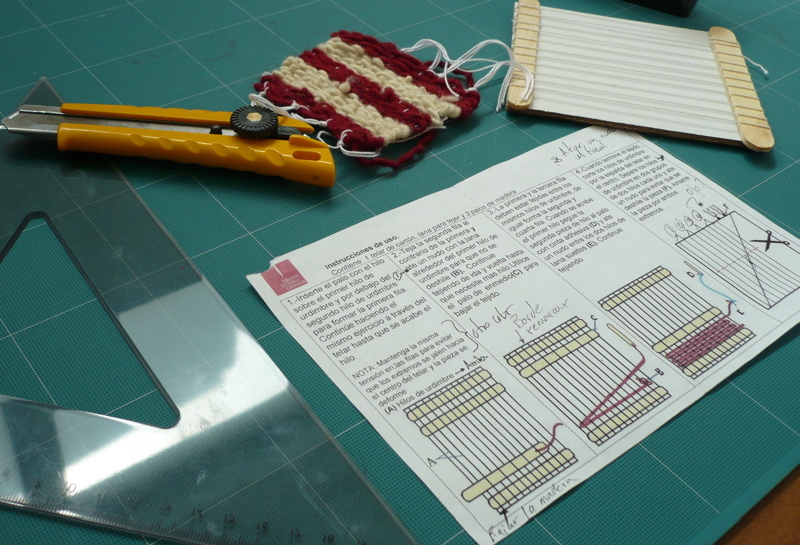 Members must bring their designs before a committee to get approval in order to proceed. Federico, Eric, Janet and Omar Chavez are experimenting with new designs that are not literal replicates of traditional patterns. They are playing with color, the variation and variegation of color, circles and curves. 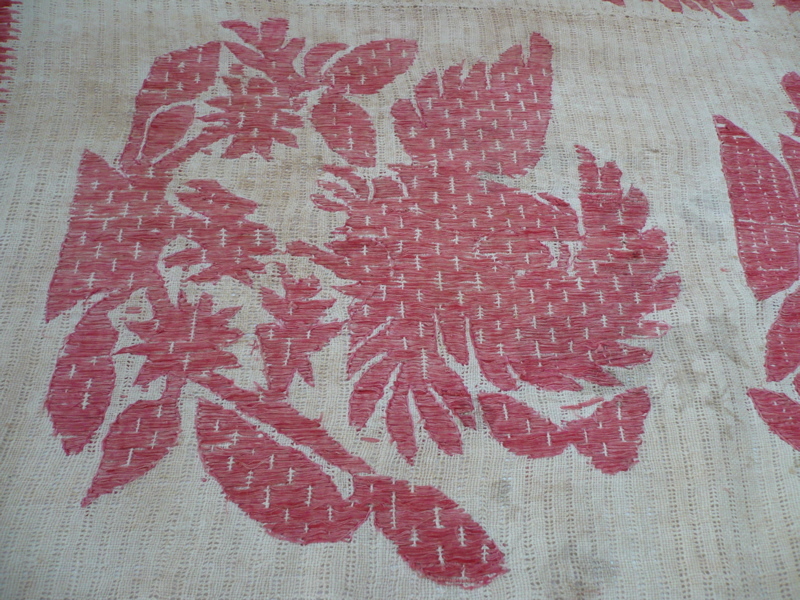 They are also continuing to weave the traditional patterns for which their family is known. I read recently that an artisan is truly an artist when she or he continues to experiment and innovate. Imagination drives development of an art form. Repeating what has been successful in the past is a sure way of doing business but it is not necessarily part of the creative process. As one becomes familiar with Mexican rug weaving patterns and the variations that weavers are incorporating into the traditional patterns, you can begin to discern the masterful from the mediocre.